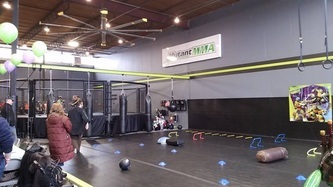 Have your child’s birthday at Mutant MMA. Spend a Saturday or Sunday with us here, and let us host your child’s birthday party. One hour of instruction on the mats with a martial arts instructor and an obstacle course for the kids to run. They have fun, while working on team building skills, focus and even get a healthy workout in all while celebrating your child’s birthday. As a parent, sit on the sidelines and actually be able to watch your child have the greatest time instead of having to tend to the details that take you away from enjoying and sharing their day with you. For up to 15 children, we have pizza, and cake served at a table covered with balloons and decorations after the kids play and run on the mats. Everything is included in the $500 price. We take pictures and send them to you, making sure you have the memories of spending your child’s special day with them and their friends! Call today for a walk through of the gym and to schedule your child’s party today!